In celebration of her recent release The Beautiful Between, Alyssa Sheinmel is giving us a glimpse into closet of her main character, Connelly. If you haven't yet, check out my review of this fantastic work here. In The Beautiful Between, Connelly talks about her clothes – sometimes a lot. I know different readers will interpret this trait differently, but personally, I never intended for this to be a shallow part of her character. Connelly does indeed focus on her outfits after hearing bad news, she obsesses over what would be appropriate to wear to a funeral: wearing the right clothes was the one thing that Connelly believed she could do right when she was otherwise powerless to do anything to help. Connelly isn’t often comfortable expressing herself out loud, so clothing is a way for her to show the people around her a little bit of who she is. It’s a way for her to fit in, and – I think maybe someday – it can also be a way for her to stand out. And, clothing is part of Connelly’s relationship with her mother; her mother taught her from a young age that whether or not she knew the right things to do or say, she could at the very least look the part. When her relationship with her mother began to grow distant, they could still always shop together. It reminds me of stories about men watching sports with their otherwise closed-off fathers. They had baseball; Connelly and her mother had shopping. And so, now, a glimpse inside Connelly’s closet. It’s a long skinny closet, and Connelly tries to keep it organized. On the left, she hangs her jeans – and she has a lot of them. Jeans are her standby: the right pair can allow her to blend in with the crowd, or stand out from it. She has boot-cut, straight-leg, skinny and distressed boyfriend-style. They’re mostly dark blue, so she can dress them up or down. Next to the jeans are her college interview outfits. Even though Connelly knows that wearing the right outfit to her college interview is not quite as important as her grades and entrance essays, she still thinks it’s essential to make the right first impression with just the right outfit. Shopping for the right outfit made her feel a bit like Goldilocks: too casual, she thinks, and she’ll look cocky, like someone who believes she doesn’t have impress anyone to get into school. Too dressy though, and she’ll loo k like she’s trying too hard, and won’t fit in with the rest of the student body. She has one pair of gray slacks that fit close around her hips and are loose around her ankles. She can wear them with a white t-shirt and a boyfriend blazer or cardigan sweater and look just right. In the middle, she has some hanging shelves with stacks of sweaters. Connelly hates being cold. She has lots of cardigans, including a huge wool one that Jeremy lent her (and which she promptly decided to keep), when they were standing outside once and she got cold. The cuffs hung down over her wrists and she burned cigarette holes around the edges. Outside Connelly’s closet is a chest of drawers. Two drawers are dedicated entirely to pajamas. Connelly spends a lot of time in The Beautiful Between in her pajamas, since Jeremy mostly comes over after she’s gotten ready for bed, so she has plenty of soft cotton pajama pants and sweatpants that she pairs with tank tops and tee shirts. 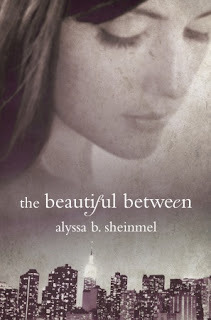 Thank you Alyssa and everyone, be sure to pick up your copy of The Beautiful Between soon! You can continue to follow this tour over at Hollywood Crush tomorrow.